What do your kids think of when they hear the word 'treat'? My kids are 2 and 5yrs old and I guarantee you when they hear the word 'treat' they think of sweets, chocolates and anything else equally sugary. Why can't a treat be doing something fun, going somewhere nice, playing something exciting? Is it possible, if we change our language and attitude to food, for strawberries to be on a par with sweets and doughnuts no more appealing than doughballs...? To have any hope of achieving this we need to bring some balance to the table at times of celebrations. Actually we need to do many things. Including healthy foods at times of celebration will not miraculously fix a skewed relationship with food but it's a good start. 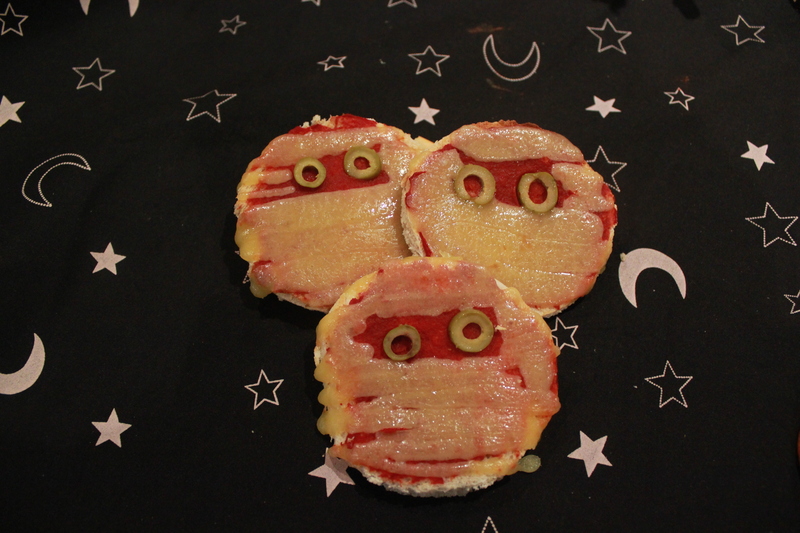 So let the 'treats' of Halloween not only be about jelly sweets and chocolate frogs but also about satsuma pumpkins and mummified pizzas. Chop a banana into 2 equal halves and stand on it's cut end. Using a cocktail stick make 2 small incisions for the eyes and push a currant or small raisin (chopping a raisin in half works well if you don't have currants) into each hole. 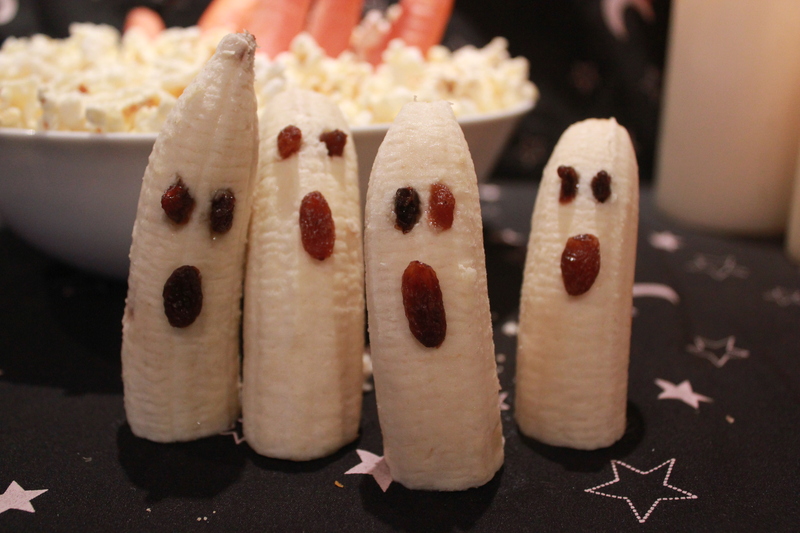 For the mouth use a small amount of cream cheese as an adhesive to stick a raisin or sultana onto the banana. A long oval shaped raisin or sultana works well. Wash and thinly slice a potato. Cut 2 small round holes in each slice for the eyes and a larger oval shape for the mouth (see picture). Tip - we used a clean felt tip pen lid as a cutter for the eyes to ensure a uniform shape. 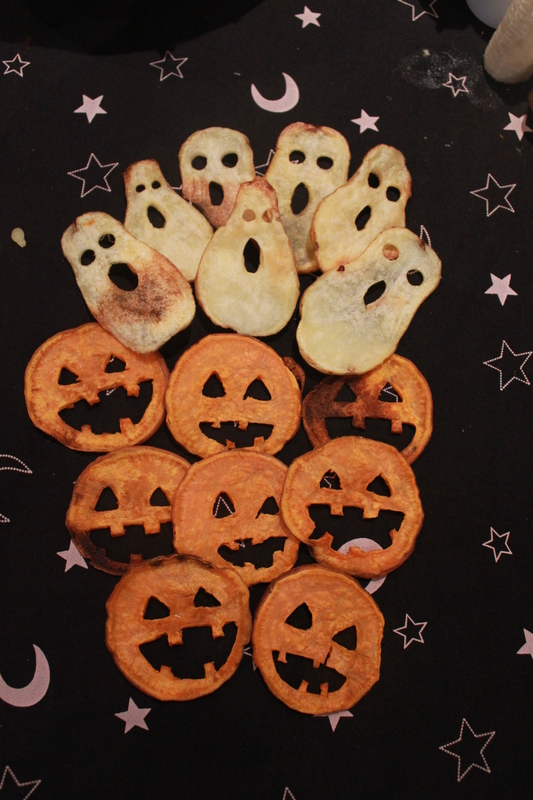 Brush each potato ghost lightly with oil, place on a greased backing try and bake in the oven for 15 minutes at 180C or until golden brown. Cooking times will vary depending on how thick your potato slices are. Wash and thinly slice a sweet potato into round discs. Using a small sharp knife cut triangles for the eyes and create your own scary looking mouth (see picture). Brush each pumpkin face lightly with oil, place on a greased backing try and bake in the oven for 15 minutes at 180C or until golden brown. Cooking times will vary depending on how thick your potato slices are. 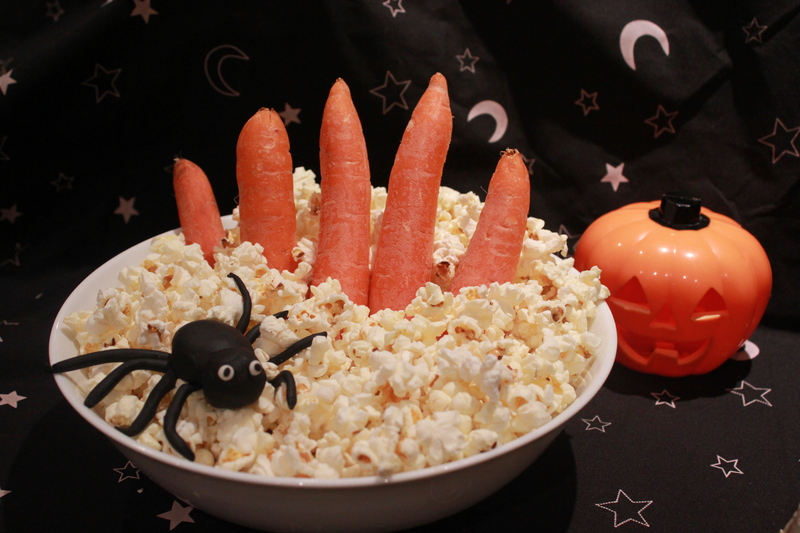 Take a bowl of plain popcorn and arrange 5 carrots into the bowl to create witch’s fingers. 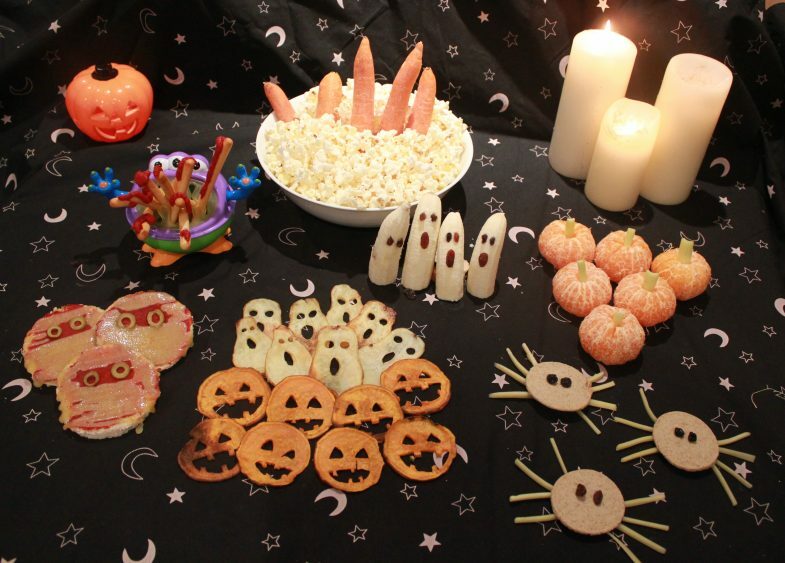 This simple snack couldn't easier and makes a great display for your Halloween treat spread. Add some plastic spiders for extra spooky effect! 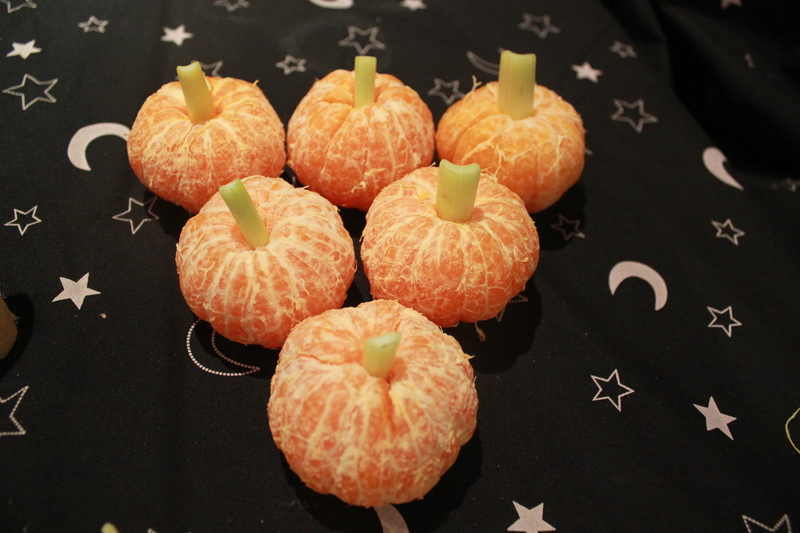 Peel a satsuma and place a small piece of celery into the top to create the pumpkin stalk. Simple and effective! Spread an English muffin (you could also use a crumpet or pitta bread) with tomato puree. Use sliced olives for eyes and thin strips of cheddar cheese for the bandages (see picture). Grill for 3-5 minutes or until the cheese has melted and the muffin is crispy. 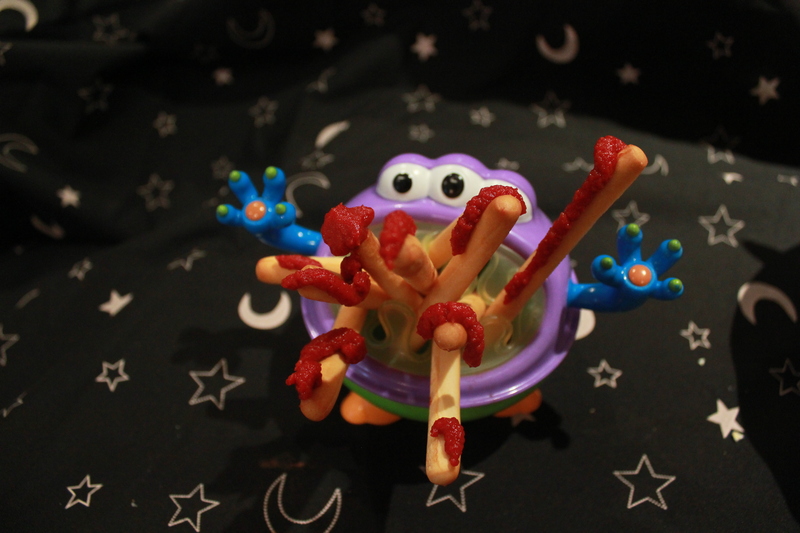 Breadsticks drizzles with tomato puree make this tasty snack look suitable gruesome! Display in a Halloween themed bowl if you have one or alternatively decorate your bowl by wrapping in black paper and adding or drawing spiders, cobwebs or vampire teeth. Take an oatcake and spread it with peanut butter or cream cheese. 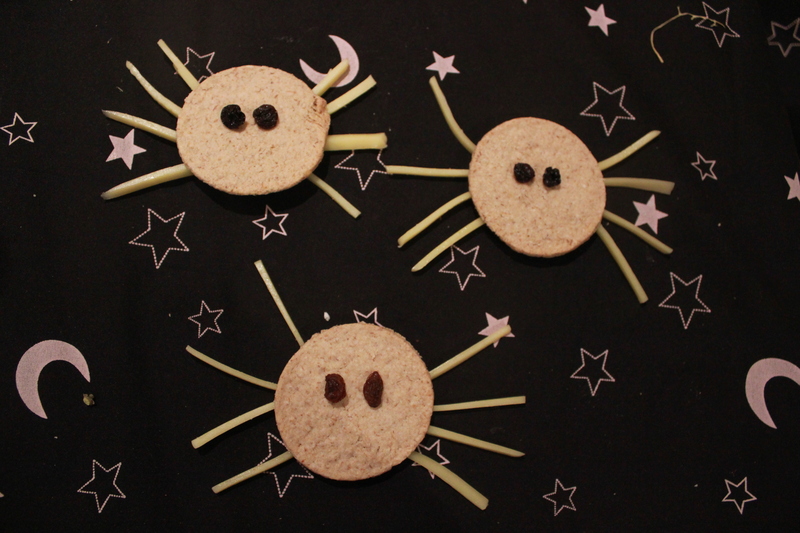 Arrange 8 thin strips of cheese on top of the oatcake to make the spider's legs (as per picture). Spread more peanut butter or cream cheese on another oatcake and sandwich it on top of the spider legs to create your sandwich. Add 2 currants or small raisins for eyes - these can also be held into position by using a small amount of peanut butter or cream cheese if needed.